First of all a bit of news. 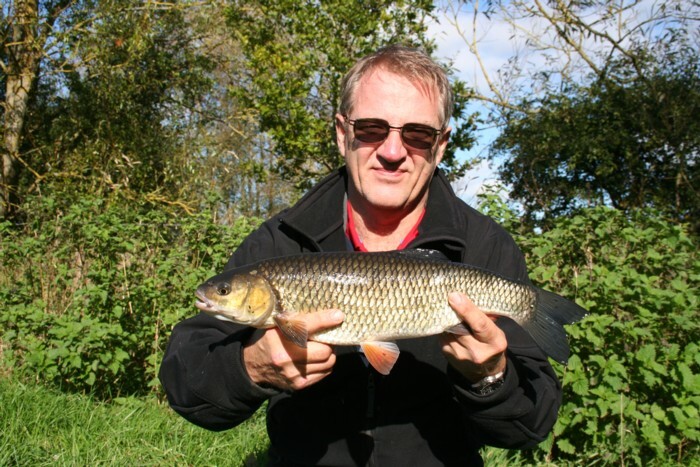 Ian had contacted me to say that he and Laurie had been fishing further down the river in the deeper parts on the Bristol Avon and had been catching lots of smaller fish but wanted to do a bit of sight fishing for larger fish. So we promptly arranged to meet at 8am on a cool autumnal Sunday morning. 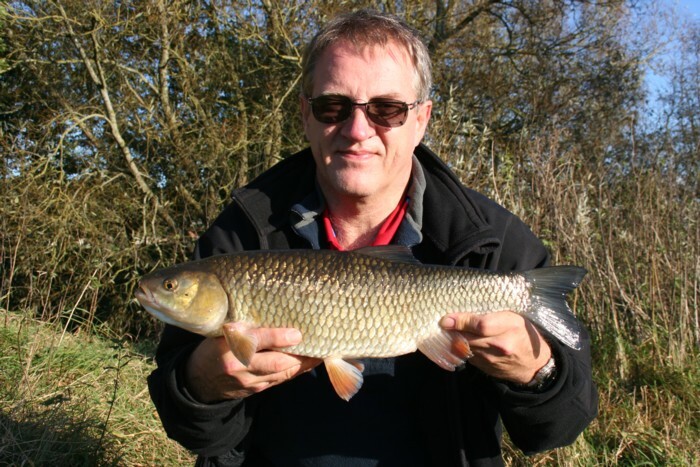 We were going to fish a swim where I had seen plenty of chub on Friday and had them feeding well at my feet. There were a couple of very good fish of approaching 5lbs amongst them. In all about 10 chub were feeding on the pellets I put in. Soon after some tuition on knots and rigs that we were going to use we were ready to go. However the chub hadn’t been told about this. We had a couple of takes but no hookups. I wasn’t too surprised by this as it was well into a beautiful sunny morning which was going to make the fishing difficult. I spotted a couple of very large barbel in a group of 3 below a snag as we walked to another swim. And it’s here where you take for granted your own spotting abilities, as both Laurie and Ian had trouble seeing them. I guess it’s all about practice. We moved onto another part of the river. Soon we were baiting up a swim with hemp and wandering off to fish some other swims. The 5 minute banker swim produced nothing after 40 minutes other than a small pull. So we went back and tried in the swim where we had baited with a dropper. It was Ian’s turn to look after the rod and after a short while he was into nice chub of 4lbs 8oz. Ian was more than pleased about this chub as it was personal best. The chub took a hair rigged pellet. Unfortunately the lower lob of the tail was missing, so this fish has had a lucky escape at one time. Soon it was Laurie’s turn to sit in the hot seat. 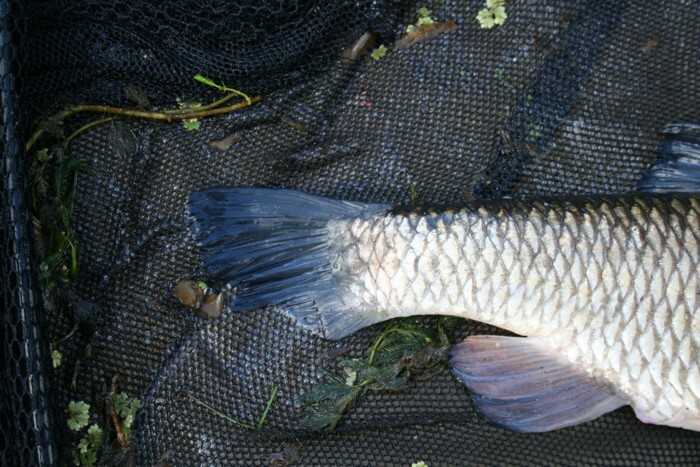 The chub could still be seen drifting in over the hemp and pellets however there was no sign of the barbel. The next thing Laurie knew was that his rod had been pulled down the bank and into the river. Luckily the fish had gone unlike his rod which had stopped, with just the tip in the river. Laurie was ready for the next fish where the line pulled tight and soon he was playing a chub of 3lbs 4oz. So having caught a couple and lost another in the swim we decided to move on downstream to fish a couple of other places. We only spotted a few more chub and someone was fishing another one of my banker swims, so we had to move on again. This time we returned to the very first swim. Ian dropped off just above us to fish for the last couple hours of daylight while Laurie and I wandered off just a little downstream. Sure enough the chub again came straight out on the pellets and ready fed hard. Laurie could see the odd fish ghosting in and out, but there were plenty there. Out went a PVA bag and the rig. We ddin’t need to wait long before I saw a chub belt off for the snag after it had been hooked. Laurie reacted quickly and soon had the fish ready for netting. I climbed down the bank netted the fish and handed the landing net back up. 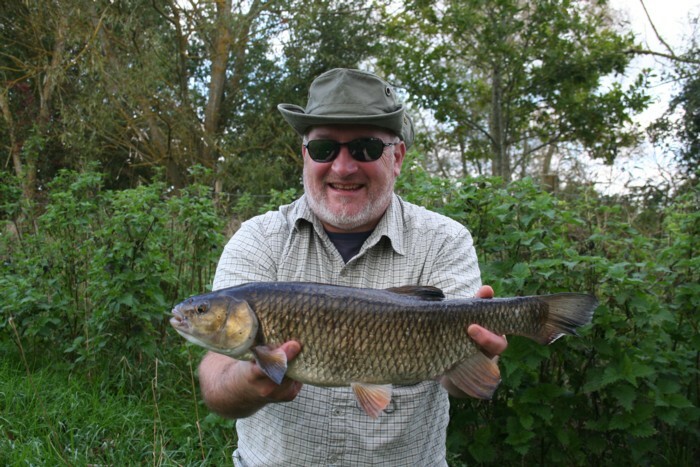 It was one of the most perfect chub I had seen from the Bristol Avon. After completing the photo’s we slipped it back downstream as to not disturb the others. Soon Laurie was set up again with the bait in the river on the hot spot. I think another 5 mins passed when he had a repeat take, again I saw the fish bolt off feeling the hook and Laurie lifted the rod a split second later into the chub. It’s fantastic sight fishing and seeing the chub take the bait. During the first visit in the morning I saw a chub pickup the bait shake it’s head and the hook and bait fell out. Laurie again helped me down the steep BA bank to net the fish. Not one of the 5lbers but a nice fish. Ian and Laurie and his 3lb plus chub. Since Ian had been struggling to get anything in the other swim we decided to get him to cast in and see if he could catch one. Again in no time at all the chub shot off and Ian was left playing a good chub. It looked like another good one. More climbing for me saw the fish in the net. It was another 3lb plus chub. We put it back downstream again. The sun was now very low in the sky and everything had that lovely autumnal golden glow. Ian cast out again and still the chub were feeding. Soon I saw a chub belt off from the feeding area and Ian’s rod arched over as he was playing a nice chub that looked like another 4lber. 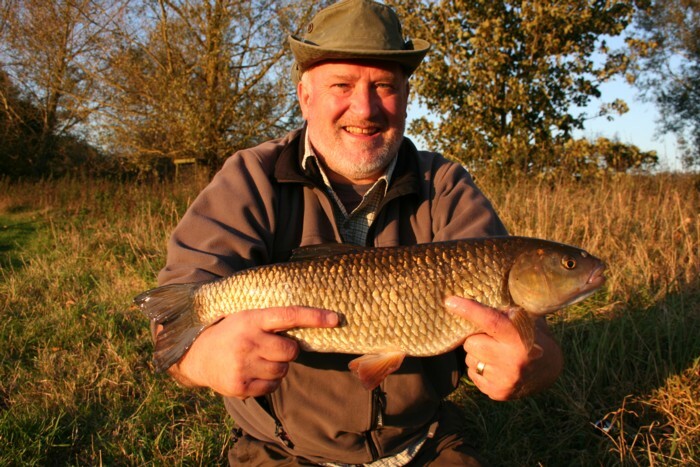 Ian and his 4lbs 4oz chub in the autumn golden glow. The sun was getting even lower and I think Ian and Laurie were very pleased with the catches and the results of the day. 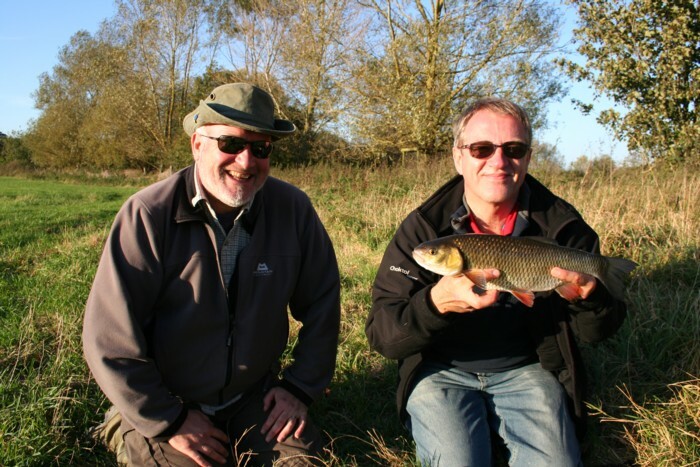 Both had pb chub and now had a good idea of where there are some good chub and barbel. They both learnt how to tie the rigs and combined with the swim knowledge all of this could be used for future visits. There were a couple of lesson for them, one was the pulling power of both hemp and pellets. Also the fact that if the fish are not willing to feed hard around midday then they can be easier to catch as dusk approaches. 4 chub from a small swim in the late afternoon was a good result. This entry was posted on Thursday, October 20th, 2011 at 12:41 pm	and is filed under Uncategorized. You can follow any responses to this entry through the RSS 2.0 feed. Both comments and pings are currently closed.